After first denying that the Iranian military had captured the CIA’s RQ-170 Sentinel spy drone, and then reluctantly acknowledging the fact only after PressTV aired footage of the killer bot, the Associated Press reported that “the Obama administration said Monday it has delivered a formal request to Iran” that they return it. In Washington’s bizarro world where war is peace the United States, which has Iran surrounded with a string of military bases and where nuclear-armed aircraft carrier battle groups and submarines ply the waters of the Mediterranean and the Persian Gulf, the aggressor is magically transformed into the aggrieved party. Whether the IDF’s newly-launched “Iran Command,” will prove any more effective than the CIA or Mossad, which suffered major set-backs when their intelligence nets were rolled-up in Iran and Lebanon as Asia Times Online recently reported, is an open question. War “by other means” however, will continue. On Wednesday, the U.S. House of Representatives passed by a vote of 283-136 the Iran Threat Reductions Act (H.R. 1905), a draconian piece of legislative detritus which hopes to crater Iran’s Central Bank. The following day, the U.S. Senate followed suit, approving the legislation by an 86-13 vote. President Obama has said he would sign the bill, cobbled-together by war hawks as part of the massive $670 billion 2012 Defense Authorization Act. With few exceptions, corporate media in Europe and the U.S. have played accessory roles in ginning-up the so-called “Iranian threat,” a decades’ long program to secure hegemony over the energy-rich regions of Central Asia and the Middle East. When initial reports surfaced that the drone had gone missing deep inside Iran, “CIA press officials declined to comment on the downed drone and reporters were directed toward a statement from the military,” The Washington Post reported. Indeed, the International Security Assistance Force (ISAF), the NATO-led alliance currently occupying Afghanistan, dismissed Iran’s claims that the drone was operating over their territory. “The UAV to which the Iranians are referring may be a U.S. unarmed reconnaissance aircraft that had been flying a mission over western Afghanistan late last week,” the ISAF statement read. “A U.S. satellite quickly pinpointed the downed drone, which apparently sustained significant damage,” the “senior official” told the network. While first claiming that the CIA drone had strayed off-course, CNN reported after the Sentinel was publicly displayed, that unnamed “U.S. military officials” re-calibrated their tale and now said that the drone “was on a surveillance mission of suspected nuclear sites” in Iran. As with their earlier reporting, CNN’s latest explanation was a fabrication. In fact, as The Washington Post disclosed in September, the CIA and the Pentagon’s Joint Special Operations Command (JSOC) are thick as thieves. “Sometimes their missions are considered military ‘preparation of the battlefield’,” the Post reported, “and others fall under covert findings obtained by the CIA. As a result, congressional intelligence and armed services committees rarely get a comprehensive view,” which of course is precisely what the Agency and Pentagon fully intend. Now sensing the jig was up and that a face-saving meme had to be injected into the news cycle, a “former intelligence official” continued to discount Iranian assertions that their armed forces had brought the drone down. “It simply fell into their laps,” he told CNN. However, much to the consternation of American officials, Iranian spin doctors were running their own info op, one which cast U.S. claims in a most unflattering light. “Ali Akbar Salehi said Tehran finally went public with its possession of the RQ-170 Sentinel stealth drone to disprove contradictory statements from U.S. officials,” AP reported. Unlike American and Israeli assertions that Iran is taking steps to “go nuclear,” Iranian officials at least had hard evidence on their side that the United States was violating their territorial integrity–the captured U.S. drone. Although Western “defense experts” have ridiculed claims that Iran’s electronic warfare specialists have captured the Sentinel rather than recovering the downed craft from a crash site, a report by The Christian Science Monitor shed new light on Iran’s apparent capabilities. Earlier reports suggested that Iran, which had recently been supplied with the Russian-built Kvant 1L222 Avtobaza Electronic Intelligence (ELINT) systems, may have been a factor in the drone’s capture. The Monitor investigation however, suggests that the Iranians had accomplished this feat on their own. Regardless of the means employed, statements by U.S. officials that all the Iranians had was “a pile of rubble” were blatant falsehoods. It would seem then, if this account is accurate, that Iranian defense experts had already “figure[d] out what they have and what to do with it” from earlier captures. As Antifascist Calling reported in 2009, Iraqi insurgents battling the U.S. occupation had deployed $26 off-the-shelf spy kit which enabled them to intercept live video feeds from Predator drones. What the Iranians claim to have done, according to defense experts, are orders of magnitude greater than simply capturing a video feed. Indeed, if this report is credible, it would have wide-reaching implications for other U.S., Israeli and NATO aircraft and missiles which similarly rely on GPS to guide them towards their targets. In plain English, this means that the “control and command link to communicate from a control station to the drone” and the “data link that sends mission control data and video feeds back to the ground control station,” for both “line-of-sight communication paths and beyond line-of-sight communication paths” are hackable by whomever might be listening. On December 13, the secret-shredding web site Public Intelligence, published a leaked U.S. Air Force document, USAF Operating Next-Generation Remotely Piloted Aircraft for Irregular Warfare, SAB-TR-10-03, dated April 2011. Classified “For Official Use Only,” the 110-page report issued by the United States Air Force Scientific Advisory Board (SAB), revealed that drones or “remotely piloted aircraft” (RPA) are subject to a number of vulnerabilities. 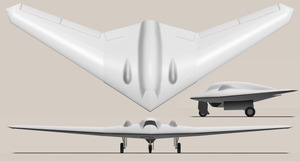 However, the RQ-170 Sentinel, which can operate at 50,000 feet would not have been vulnerable to “MANPADS” or “low-end SAMs,” and was certainly not brought down by an Iranian air-to-air missile; therefore, a valid explanation of its capture would be the one offered by Iran: electronic countermeasures developed by the Islamic Republic. 1. Jamming of commercial satellite communications (SATCOM) links is a widely available technology. It can provide an effective tool for adversaries against data links or as a way for command and control (C2) denial. 2. Operational needs may require the use of unencrypted data links to provide broadcast services to ground troops without security clearances. Eavesdropping on these links is a known exploit that is available to adversaries for extremely low cost. 3. Spoofing or hijacking links can lead to damaging missions, or even to platform loss. 1. Small, simple GPS noise jammers can be easily constructed and employed by an unsophisticated adversary and would be effective over a limited RPA operating area. 2. GPS repeaters are also available for corrupting navigation capabilities of RPAs. 3. Cyber threats represent a major challenge for future RPA operations. Cyber attacks can affect both on-board and ground systems, and exploits may range from asymmetric CNO [computer network operation] attacks to highly sophisticated electronic systems and software attacks. “Theft of this technology via cyber attacks against the companies doing R&D and manufacture of the aircraft is ongoing,” Carr noted. While Carr’s observations are true as far as it goes, the “serious errors in judgement” begin with chest-thumping U.S. and Israeli politicians who believe they have a monopoly when it comes to dictating policies or invading other countries, killing people on an industrial scale, stealing their resources and reducing their cities to smoking ruins as was done in both Gaza and Fallujah. While it is not possible to verify these claims, indeed they may be nothing more than propaganda offerings from Iranian spinmeisters, if their assertions are accurate, a technological leap such as this would pose a serious threat to any attacking force. We were told by military experts this was not possible; however, who would have dreamed that the Achilles’ heel of Pentagon robo-warriors, blinded by their own arrogance and racist presumptions about the “Arab” or “Persian mind” was something as simple as their own imperial hubris. Tom Burghardt is a researcher and activist based in the San Francisco Bay Area. In addition to publishing in Covert Action Quarterly and Global Research, he is a Contributing Editor with Cyrano’s Journal Today. His articles can be read on Dissident Voice, Pacific Free Press, Uncommon Thought Journal, and the whistleblowing website WikiLeaks. He is the editor of Police State America: U.S. Military “Civil Disturbance” Planning, distributed by AK Press and has contributed to the new book from Global Research, The Global Economic Crisis: The Great Depression of the XXI Century.